The drive up to the South Rim is rather dull from Williams, AZ, on Highway 64, compared to the first sight of the humongous crack in the earth known as the Grand Canyon. As you get past the "guard house" and make your way to the Grand Canyon Visitor Center, the thought you might have in your mind is, "Where is the canyon itself?" Once you actually see the canyon, you will likely be speechless. Depending on the purpose of your visit, you might want to consider staying for more than just a day or two. 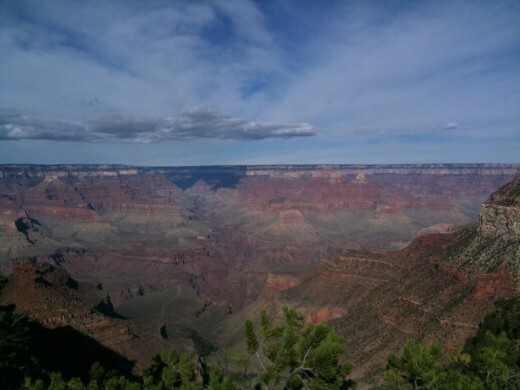 From my experience, two days allow you to see quite a bit of the South Rim, but if you want to visit the North Rim as well, you'll have to stay more than two days. 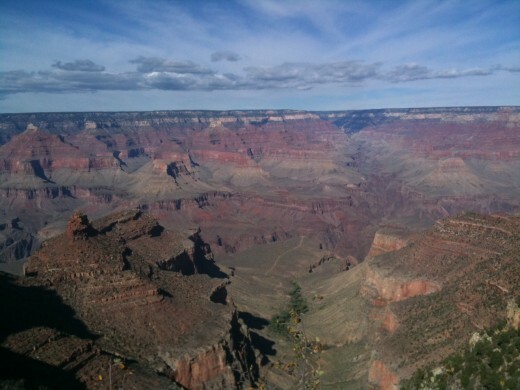 It takes five hours to drive to the North Rim from the South Rim. 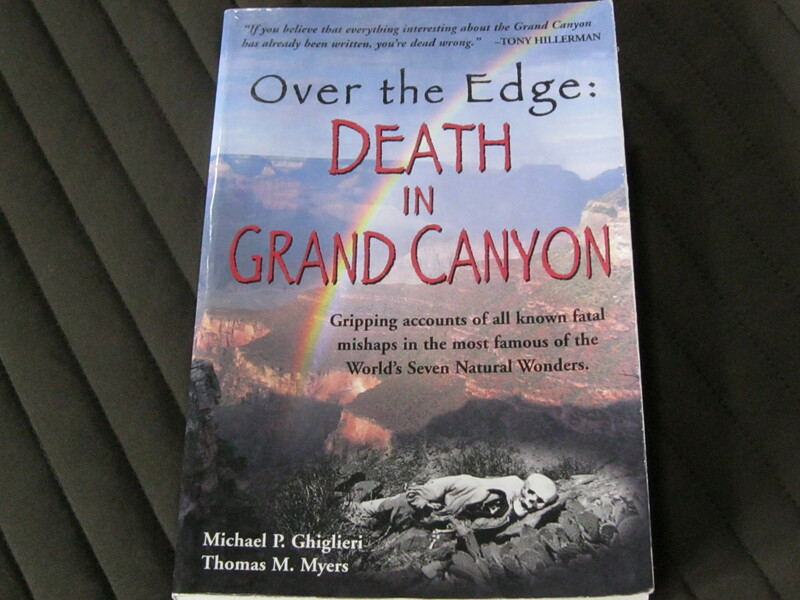 Most people who visit the Grand Canyon end up along the South Rim. It is open 365 days a year, 7 days a week. The least crowded time to visit is between November and February. 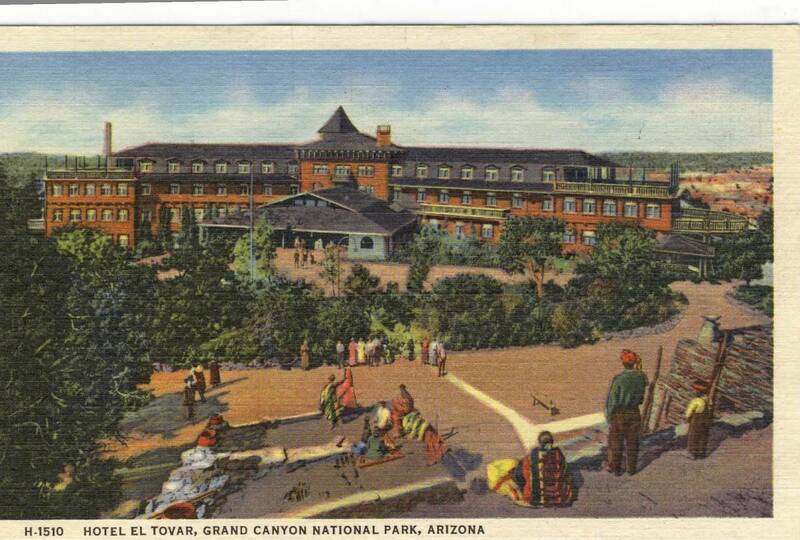 The hub of all the activities is at the Grand Canyon Village. There are also many parking areas for people to leave their cars and go on adventures in the canyon and along its rim. The village contains lodges for visitors to spend the night, a train depot, gift shops, and viewing areas. There is an internal shuttle system that transports visitors around so you don't have to move your car during the day to get from point A to point B within the village. While in the visitor's centers scattered throughout the South Rim, find out more about the various Ranger Programs that you might be interested in joining. The rangers provide information "talks" about the geology of the area, the plants and animals that live there, and the native peoples of the area, among other interesting topics. There are many hiking trails for a variety of skill levels, ranging from the relatively flat Rim Trail to Hermit's Trail, a steep, unmaintained trail into the canyon. 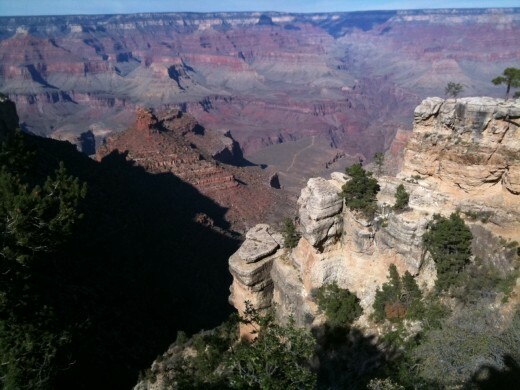 The Rim Trail is an easy trail that allows you to walk along the South Rim. There are lookout points along the way, giving visitors a different view around every corner. The trail runs from Hermits Rest to South Kaibab Trailhead. The Hermit Trail is for experienced hikers who have the right gear. If you decide to take any hike into the canyon itself, be sure to bring a ton of water. The desert heat can cause dehydration very quickly...and remember, when you are hiking down into the canyon, you have to get back out somehow and the return trip will be much more difficult being uphill. Note: If you want to hike from the South Rim down to the Colorado River, it will take you two days. 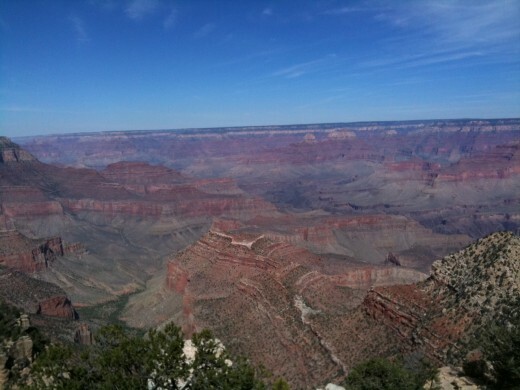 If you want to drive along the rim rather than hike along the rim, you might want to drive on Desert View Drive. This two-lane road takes you along the eastern part of the rim and provides you with turn-outs so that you can stop along the way and enjoy the various views. This is a very nice drive that takes you to the Tusayan Museum and Ruins. On this drive, look for The Watchtower as well, designed by Mary Colter. It has 85 steps to reach the highest point on the South Rim where you can take a 360 degree look at the view from the top. For a very different perspective from any of the viewing locations along the rim, you can enjoy the canyon walls by rafting through the Grand Canyon. You can float with a commercial raft company and spend 1/2 to a full day on the Colorado River. Another options is to apply for a permit and take your own float down the entire section of the river that floats through the Grand Canyon. That could take between 2 and 5 days. To find out more, visit the rafting section of the National Park Services website. Another mode of transportation available at the Grand Canyon is travel by mule. The mules share trails with hikers. There are stables in the Grand Canyon Village where the mules are housed. 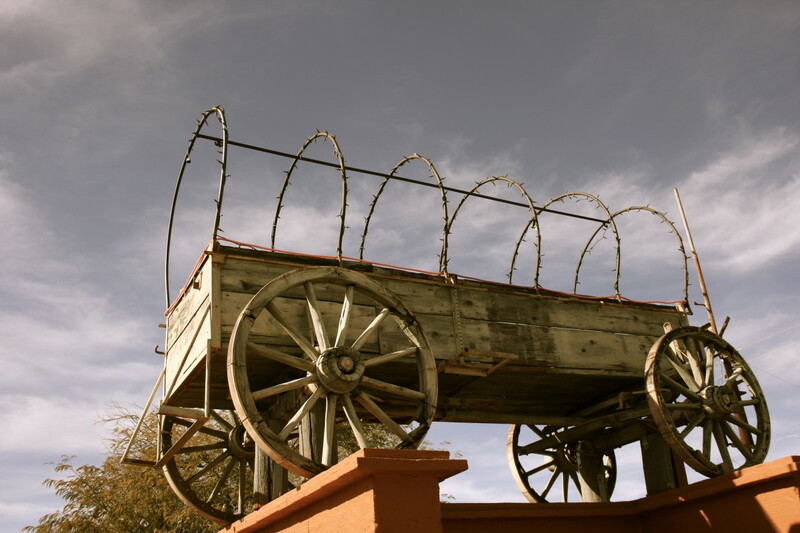 More so than not, the mule trips are booked up to 13 months in advance so plan early! 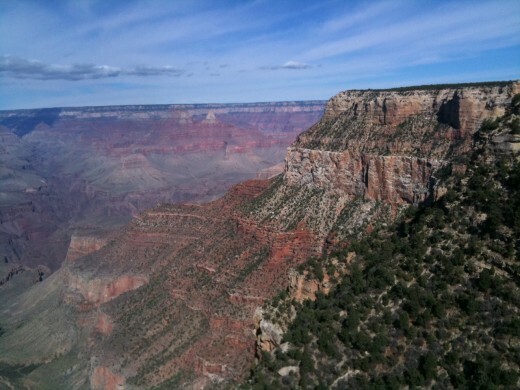 From the South Rim, you can either go on a three hour mule ride or an overnight mule ride. 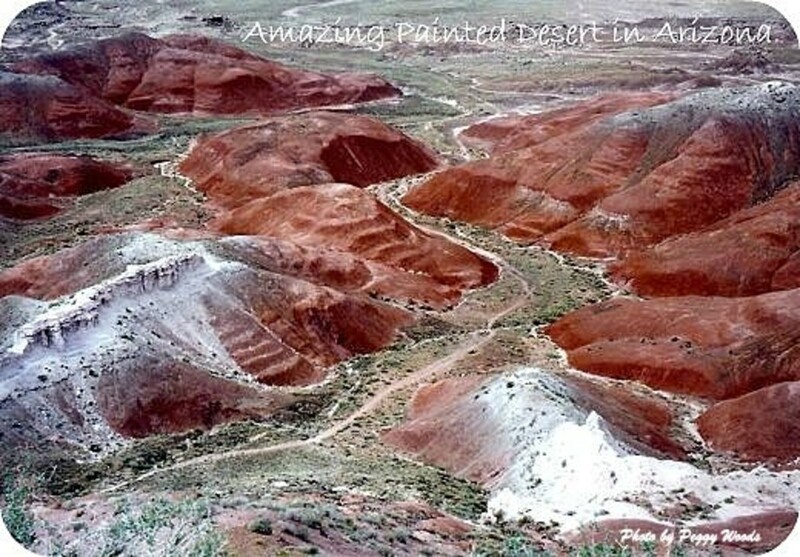 For more information, visit the mule-riding section on the National Park Services website. There is ample lodging at the Grand Canyon that is conveniently located within walking distance of many of the trailheads. All the lodges are managed by Xanterra Parks and Resorts. For more information about these particular lodges, visit www.grandcanyonlodges.com. For less expensive options, you might also want to look into staying in Williams or Flagstaff. They are both between a 30 - 45 minute drive south, but you'll find chain motels and hotels that are less costly than staying right on the South Rim. A certain feeling of overwhelming peace takes over when looking out into the canyon. If you've never been there, no words can describe the experience. 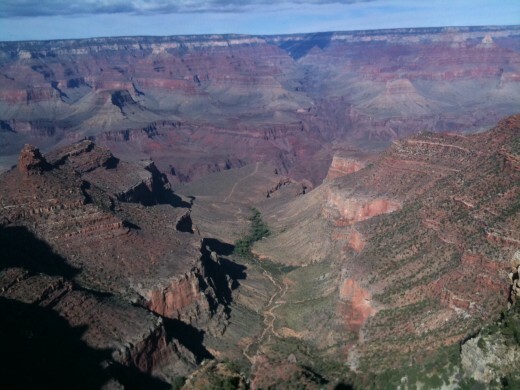 A certain level of spirituality engulfs the soul when you stand at the edge and look out into the canyon. No words can accurately describe the feeling. 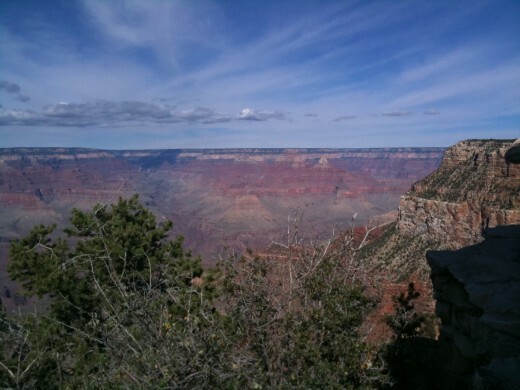 On your next visit, take some time to just sit and look out into the canyon. The thoughts that enter your mind and the details you take in as you look out into the vastness of the canyon is absolutely surreal! Great article! I especially liked the fact that you pointed out that it is likely you will need to reserve mule rides 13 months in advance. There is one correction that you should make - Williams is an hour away from the South Rim and Flagstaff is an hour and a half. 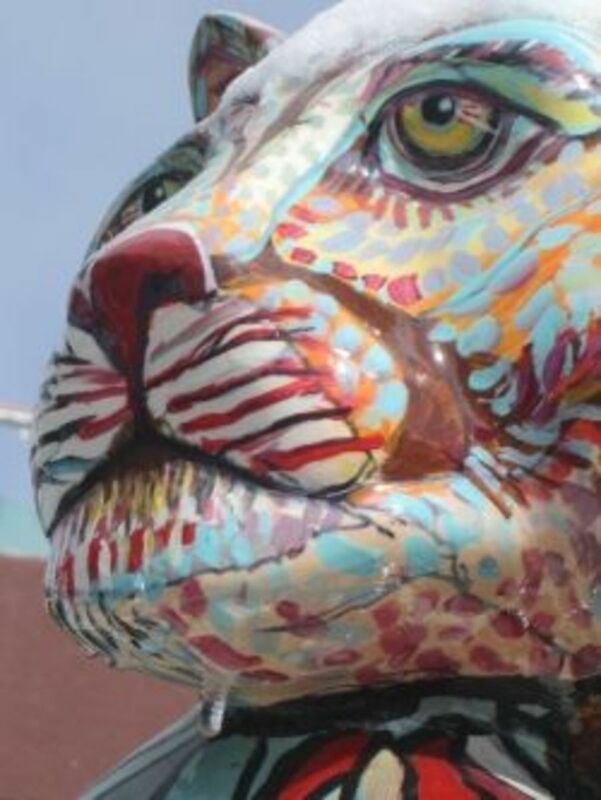 I love your pictures; they are very vibrant and beautiful! Beautiful Pictures! Yep...goin' on my Bucket list! :) Thanks for sharing! @katrinasui, thanks for your comment. 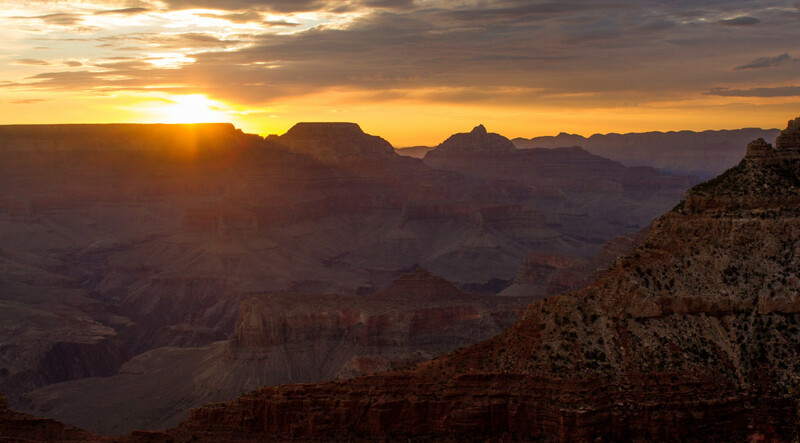 If you've never been, you should add visiting the Grand Canyon to your list of things to do. We went there in 2007 and I too was mesmerized by it's beauty and majesty. It's a very inspiring place to visit at least once in your life! WOW. This place is awesome.